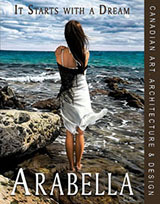 ARABELLA provides unique, in-depth visual and narrative access to the world of contemporary art, architecture & design from a Canadian perspective. More a journal than a magazine, we offer a beautiful and engaging reading experience that truly showcases the exceptional art, architecture and design products and services available to Canadian & US consumers. We offer artists, art galleries and creative product businesses a unique opportunity to connect to a wide geographical market of appreciative consumers. ARABELLA excels in the art of storytelling and providing an almost gallery-like experience of some exceptional works of art, architecture and design. Discover and explore the personal stories of individuals and businesses that are aspiring, achieving or accomplished in their creative endeavours. Be absorbed by the full colour, visual format and captivating layout. Each issue provides a compelling journey that lasts well beyond a quick scan and becomes a lasting treasure. There's really nothing like it! Our readers love it! See if you don't agree that it is quite simply... "Beautiful!"... "Unlike anything in Canada & the US!"... "A work of art!" INCREASE ANNUAL SALES BY UP TO 300%! ARABELLA's unique focus on art, residential architecture, landscaping, interior design and luxury lifestyle products and services provides an ideal platform for a wide range of arts, culture and lifestyle advertisers. ARABELLA combines high end print with on-line and mobile distribution as well as extensive social media promotion to ensure we reach all possible audiences! Our mobile and on-line readership is expanding internationally as a result of our growing network of Facebook and Twitter fans and followers. 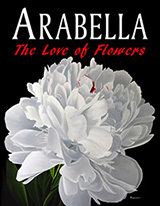 With combined print and digital distribution ARABELLA has a reach that well exceeds 150,000 readers. Purchase your print copy of ARABELLA from one of several Major Canadian Bookstores & Independents OR select galleries and arts organizations ; but we do recommend talking to store management to ensure you are on their advance distribution lists as the magazine does sell out quickly. As well, be sure and ask your favourite local gallery or art association if they carry ARABELLA. Opportunities for distribution are available right across Canada. Galleries and arts and cultural organizations can generate incremental sales by acting as a major access point for the magazine. See listings on this page. Help support your local arts community and economy. The alternative to retail purchase is to order a subscription to guarantee you receive a copy. Subscription pricing includes costs for shipping and handling. Because of increasing production and distribution costs the print copy of the magazine is no longer distributed to major US book stores. US customers can order print copies by subscription or single copy purchases on-line. Four (4) issue subscriptions, and Single Issue and Back Order purchases are available directly from ARABELLA.